It's been a long time since I last updated the chibiArduino software. For the most part, the stack has been amazingly stable for the last few years but there were always small things that could be done to improve the stack. These were small features that should have been implemented but kept on getting put off. I'm now re-discovering myself after having many adventures, some time off, and going through a few personal roller coasters. It's been a long road, but I'm happy to be back and excited about wireless sensor networks again. There's really a lot of interesting stuff going on and in some strange way, things took a turn up my alley. I'm completely shocked that people are interested in low power, wide area networks (LPWANs) now and also on outdoor, medium/long range wireless sensor networks. In any case, there will be more discussion about that, about some exciting new devices coming out, some hard realizations I've had about myself, and perhaps some ruminations on wireless sensor networks too. So let's get to the release. A lot of people ask me about how to control and sequence lighting, either for installations, displays, or wearable designs so I figured I'd put together this tutorial. There's both a 2-part video tutorial and a text-based tutorial for people that prefer either style. The videos and text tutorial are after the jump. I'm proud to introduce the latest addition to the Freakduino family. 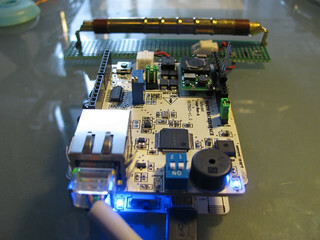 This is the Freakduino 900 MHz Long Range wireless board. On the outside, it looks fairly similar to the other Freakduino boards, but under the hood, it's tuned to communicate over long distances. 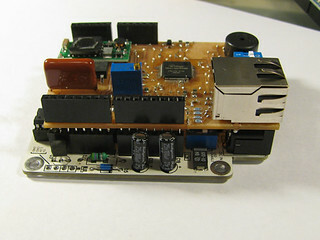 This board uses the same radio as the standard Freakduino 900 MHz board but adds a TI CC1190 RF front end. This boosts the transmit power from 10 mW (+10 dBm) to 500 mW (+27 dBm). There's also a low noise amplifier on the receiver which gives the received signal an +11 dB boost (>10X). Altogether, this chip adds +38 dB to the link budget which is massive gain in the wireless world. I originally designed this circuit a few years back when I was looking for something to do long distance wireless sensor links, on the order of kilometers or tens of kilometers. 2.4 GHz gets a bit hard to drive that far since higher frequencies have more attenuation in free space as well as a difficult time going through objects. Lower frequencies have much less attenuation and are able to travel through obstacles more easily so they're ideal for situations where range is valued over speed. In sensor networks, data rate usually has a low priority compared to battery life and communications range. Im proud to announce the release of two new designs, the Arashi Ethernet Gateway for both 2.4 GHz and 900 MHz wireless sensor networks. Theres quite a bit of history for me with this design. Back when there was a meltdown at Fukushima Dai-Ichi in Japan, I grabbed some Wiznet W5100 ICs and put together a circuit that connected to and uploaded radiation data to servers on the internet. This eventually became a design I called the NetRad and was one of the first DIY geiger counters to be uploading radiation data publicly to the internet during the Fukushima crisis. In Tokyo Hackerspace, we deployed a few of them when Sean Bonner emailed me to ask me for links to the data and if I wanted to help a fledgling group that he and Joi Ito were working with called RDTN. Later on, Sean, Joi, me, Bunnie, and a cast of others started working together and Safecast was born . Here's a shot of one of our first meetings together in Tokyo with Bunnie, Aaron Huslage, Sean Bonner, Joi Ito, Ray Ozzie, and a bunch of people from Keio University.